JNN 02 Sept 2014 Toronto : The international Muslim Fashion Designs & Festival (IMFDF) was held in Toronto last week, featuring a number of international Islamic fashion designers, bloggers and simply fashionistas. 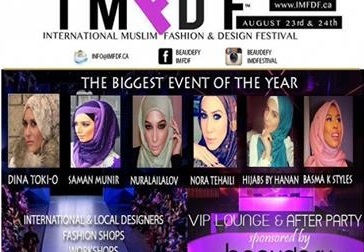 The festival was the first ever international Muslim Fashion and Design Festival, and featured many popular hijab bloggers who flew in from around the globe to witness the event which represents the rapid growth of the Muslim fashion lines. Popular bloggers who attended the event are Saman Munir, Dina Tokio, Nuralailalov, Basma K Styles, Hijabs by Hanan, Nora Tehaili and more. This entry was posted in America and tagged Basma K Styles, Dina Tokio, international Islamic fashion, Muslim Fashion Designs & Festival, Saman Munir, Toronto. Bookmark the permalink.